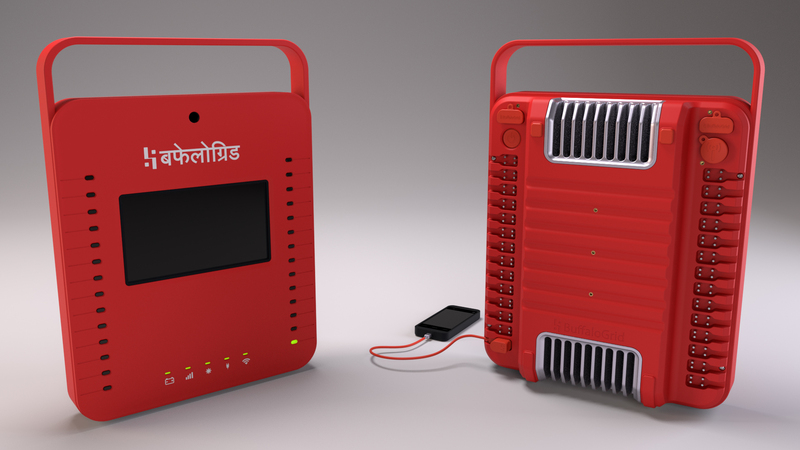 BuffaloGrid, a London and New Delhi startup that recently picked up backing from LocalGlobe and Kima Ventures, offers something akin to mobile phone charging as a service in remote parts of the world that are either without electricity or where power supply is sporadic. The company supplies an Internet-connected charging “Hub” — of which a second version launches today — and an accompanying cloud service that makes it easy for local shops and entrepreneurs to sell mobile charging and for BuffaloGrid to offer other services in the future. The hub itself is installed for free and the startup shares revenue with its partner locations, who can generate new revenue streams as well as attracting additional footfall. In a call, BuffaloGrid co-founder Daniel Becerra said that the company is targeting both off-grid and “grid-edge” communities in emerging markets (i.e. where power is non-existent or outages are common) with a wider mission to help more people get online and therefore access digital services, such as for work, education, health and entertainment. The basic and painstakingly obvious point here is that while smartphones put the internet in everybody’s pocket, without a way to keep our phones powered, connectivity and its utility is limited. He explained that the new BuffaloGrid Hub is powered by a large battery, which in turn is charged via a large solar panel or, if available, by being plugged into a regular power supply. It then provides enough juice to charge multiple phones at once, while the BuffaloGrid service itself is cloud-based, with the device connected to the Internet with its own mobile data connection. This means that the startup handles payments — paid for by the customer’s mobile phone or via cash — and can also collect data on Hub behaviour, which is used by BuffaloGrid to determine where new Hubs should be installed and what promotions should be run and when. For the end customer, Becerra tells me the first 15 minutes of charging is typically offered for free but on the requirement that they still register their phone number, and then it costs for additional charging. To that end, since being launched in 2015, BuffaloGrid says the service is running in 20 villages in India, and I’m told the new BuffaloGrid Hub is intended to enable the startup to expand its reach to “cover more than 500,000 people in India in 2018”. One area of business development being worked on is partnerships with mobile operators who can potentially own and manage their own fleet of BuffaloGrid Hubs. Meanwhile, George Henry, Partner at LocalGlobe, cites BuffaloGrid as a good example of how hardware design and software can solve critical needs. He also hints at the way the company also views itself as building a network that is able to reach off-grid or grid-edge customers, to which additional services can be sold. “You need access to power before you can access the internet. With their innovative product and capital efficient model, the Buffalo team are building foundational infrastructure to get people online,” he says. “By doing so, they are also building a valuable network that anyone who wants to sell products and services to grid-edge communities will be able to tap into”. In addition to backing from LocalGlobe and Kima, BuffaloGrid has received a grant from Microsoft. It has also been the recipient of grants from Innovate UK and the EU research and innovation programme Horizon 2020.